Mobile app development is a bit like building a clock, where you have a multitude of moving parts that must be assembled in a very specific order. You also have the watch face and the less apparent gears and cogs which equate to an app’s back end infrastructure. Oh, and application development encounters one additional challenge: you’re tasked with creating an interface that works on a wide variety of different devices and operating system versions. According to a survey of 100 developers, the average build time for the first version of a native app is 18 weeks; ten weeks building the back end and eight weeks building the front end. For a bit of context, 18 weeks is sufficient to drill a 3,000-foot-deep oil well, build 1.3 Boeing 777 airplanes, or you could take a total of 40 moon rides in Apollo 11. The development time for more complex builds – such as hybrid and enterprise apps – can be far longer. So how do you accelerate the development process and avoid costly, frustrating delays? Fortunately, many of the most problematic and time-consuming pitfalls can be avoided by choosing the right mobile app developer and understanding how to streamline the building process. It’s important to be thorough, and your developers should perform QA testing on a wide range of operating system versions and mobile devices. But the reality is that it’s simply impractical to perform in-depth QA testing and troubleshooting for compatibility with some of the older, rarely-used technologies. So unless you have good reason to believe that a large portion of your target audience will be using older technology, it’s best to perform minimal QA testing in those areas. Addressing compatibility issues with outdated software and devices can occupy a disproportionate amount of time. Instead, focus on the most current devices and operating system versions. This will cut the project timeframe, while allowing you to focus on the technology that a majority of your users are actually utilizing. Scope creep is a sneaky, gradual process that tends to occur without notice, resulting in time frame and budget overruns. Scope creep tends to occur when a project is poorly planned, has nebulous, unclear specs and a lack of change controls. Other culprits include: a failure to perform user trials at key points or failure to use a phased/staged approach. Alone, the events that lead to scope creep seem innocuous. Maybe a couple small elements are added. The one feature is replaced with another. Suddenly, you realize that one aspect of the build is a bit more involved than originally planned. Now, the project scope shifts into an entirely different realm. A successful mobile development project cannot be executed on the fly; it requires meticulous planning and a comprehensive understanding of precisely what each phase and element of the project will entail. Scope creep must be differentiated from a similar, but positive occurrence: intentionally expanding the project’s scope. A company might receive new data that prompts a decision to expand their mobile app to include a new, additional feature. Expansion is not inherently negative. In fact, it can be positive for both developer and client when it’s treated as a conscious, intentional expansion that results in a modified budget and timeline. It’s a given that good communication is vital during the mobile app development process. But the issue of timezones is one that’s frequently overlooked and underestimated. You might get an email from your developer, needing approval or seeking information that’s required to proceed to the next stage of the build. By the time you address the email, your developers have already gone home for the day, so there’s an 8-hour gap before the response is seen. Multiply this 8-hour delay by two or three days per week over the course of a few months, and you’ve experienced some major (but potentially avoidable) delays. To avoid this, you must determine precisely where your developer’s working hours fall relative to your day, so you can be sure to address communications in a manner that minimizes delays. Of course, those who hire a local tech company will enjoy a benefit since there won’t be a need to accommodate for time differentials. Regardless of location, you should develop a system for identifying key communications that hold the potential to halt progress. This could be as simple as prefacing the email subject with a specific term like “TIME CRITICAL.” You can also establish a protocol for addressing important communications, such as creating an exclusive avenue for these messages (i.e. a specific email account or a special designated area in a project management interface, like Jira or Basecamp). Creativity and innovation certainly have their place. But when it comes to some aspects of mobile app development, the industry already has a “wheel” – a pre-made structure that’s already very effective as-is. This applies to frameworks and programming for specific features or functions. By using highly refined, pre-built elements or frameworks, your app process will proceed at a faster rate since there’s less time spent programming, testing, and perfecting. It’s impractical to create a new wheel when a really effective one already exists. Instead of spending $100 and several hours of time to build your own; you can acquire an already-perfected one for just $65. At SevenTablets, our “wheel” is our open-source STAX platform, suitable for both iOS and Android builds. With this unique, scalable, open source mobile app framework, we can slash development time frame and costs by as much as 35 to 40 percent. In fact, STAX is more of a “super wheel,” as it features military-grade encryption and load times up to 85% faster than the App Store minimum. STAX is just one of the many benefits you’ll enjoy when you trust your development project to the team at SevenTablets. We understand your concerns surrounding timeframe, cost, and the overall quality of your finished mobile app. Based in Dallas, San Antonio and Austin, Texas, our world-class team of developers serving the Texas Triangle and beyond, we’re available to help with a range of B2B and enterprise mobility solutions. Contact us today to learn more. Venkatesh “VK” Kalluru is a technology and business expert with executive and hands-on experience in automating multi-million dollar enterprises and a strong record of success in creating robust information technology architectures and infrastructures. 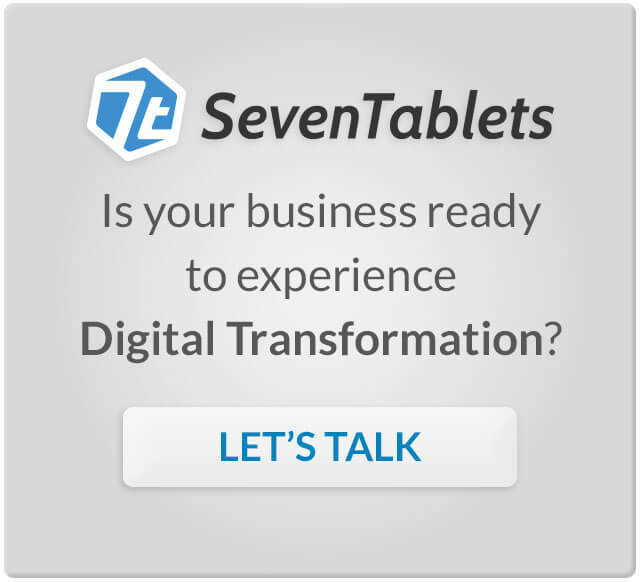 VK brings proven ability in using IT to solve business issues to the SevenTablets team. VK studied computer science at Jawaharlal Nehru Technological University in Hyderabad, India and earned a Master’s Degree in computer science at George Mason University.